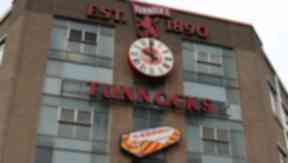 Thieves raided a man's suitcase and stole his Tunnock's caramel wafers while leaving his laptop and mobile. Michael Paterson, 26, was at Accra Airport in Ghana on his way to starting a charity trip to an orphanage in the African country. While at the airport, Mr Paterson, from Partick, in Glasgow, realised his suitcase had been damaged and broken into. A number of valuable possessions including his mobile phone, laptop and a projector, as well as football strips, were still in his case. But he realised the wafers he was planning to give to the family he was staying with as a present had been taken. Mr Paterson said: "I could not believe it. I searched high and low but traced them going missing to what happened at the airport. "I thought it had been some security check on my cases and when I saw the valuable stuff was still there I was happy to carry on my way. "I had been out in Ghana before and I knew they liked Scottish things and I thought the caramel wafers would go down a treat."